Launchpad couldn't import bug #662117 from GNOME Bug Tracker. Using brightness hotkeys currently changes brightness correctly, but such changes fail to be visible in the gnome-control-center UI; which leads to confusion and unpredictable behavior if the brightness is then adjusted using UI in the same session. 2) Switch to "Brightness and Lock"
Without the patch the slider should not move. With the patch, slider should follow brightness adjustments done via hot keys. Minimal risk. The slider does not currently follow key brightness adjustments. Possible regression scenarios could include the slider no longer responding or changing brightness when interacting with it; or more confusion in mixing up hot key and slider brightness adjustments. For systems equipped with hot keys to adjust screen brightness, the brightness gauge in "gnome-control-center screen" is not responding to brightness hot-key actions. Are those keys detected at all in the system? It could even be a kernel issue. Could you please look at https://wiki.ubuntu.com/Hotkeys/Troubleshooting ; and provide the info pointed there to the report? Thanks. Brightness keys are working and they can be used to change screen brightness. The problem is the UI in gnome-control-center is not reflecting the change of screen brightness. Hello -- Please attach logs from the machine that is impacted here, and also the intended release that should be targeted. Basically, this issue is about the Brightness bar in the Screen utility (please see the attached image) not reflecting the actual screen brightness in real time. Could somebody having the issue open a bug on the GNOME bug tracker? The issue will not block the shipment. But customer would like to see the bug is fixed and user could get the fix via future update. The attachment "Brightness-fix-for-gnome-settings-daemon-changes.patch" of this bug report has been identified as being a patch. The ubuntu-reviewers team has been subscribed to the bug report so that they can review the patch. In the event that this is in fact not a patch you can resolve this situation by removing the tag 'patch' from the bug report and editing the attachment so that it is not flagged as a patch. Additionally, if you are member of the ubuntu-reviewers team please also unsubscribe the team from this bug report. Accepted into precise-proposed. The package will build now and then be available in the -proposed repository. Please help us by testing this new package. See https://wiki.ubuntu.com/Testing/EnableProposed for documentation on how to enable and use -proposed. Your feedback will aid us getting this update out to other Ubuntu users. Tested gnome-control-center_3.4.2-0ubuntu0.3 in precise-proposed and can fix this bug. Unsubscribing sponsors, I don't see anything to sponsor here. This issue still occurs in Quantal, it seems like the fix never made it there. James, from some discussions today it may also be okay to land the fix in Raring and not Quantal. We are likely rolling over to R in the next few weeks. I really wish there was a way to take back series nominations. I meant for Quantal only, not Raring. 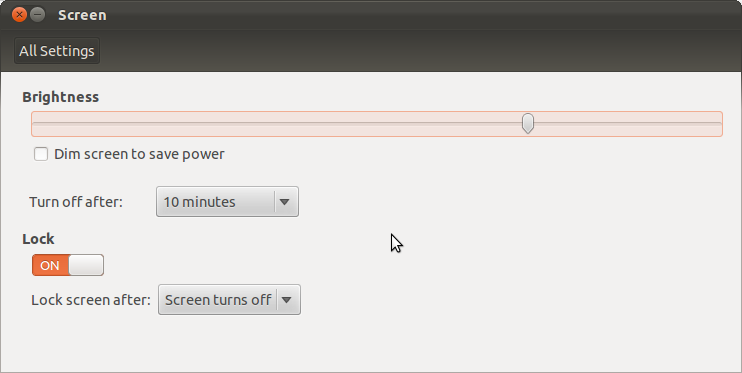 This is still broken in Q as I stated before, although it appears to be fixed in Gnome 3.4 and 3.6 trunks. 2) I instrumented the on_signal call inside gnome-control-center/panels/sceen/cc-screen-panel.c to emit a g_warning whenever any signal was received, I never saw anything come out in Q. When the same code was used in P, the message was printed. This implies, rather obviously that g-c-c is never getting the signal. Perhaps this is a problem? I don't know enough about dbus to be sure. Then ./dbus_test to run it. I don't know if this is directly related to this bug but I can easily crash gnome-settings-daemon by pressing the brightness up/down keys on my keyboard. I'm using gnome-control-center 3.6.3/gnome-settings-daemon 3.6.3 on raring.